Film Director David Lynch has announced that he will direct the sequel of the cult classic Twin Peaks after a month-long deadlock over budget concerns. The surrealist filmmaker made the announcement on Twitter. The US television network Showtime said last year that the series, based on a small-town murder in Twin Peaks, would return as a limited series in 2016, 25 years after its last airing. 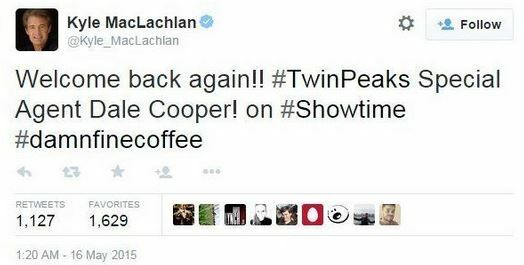 Correspondents say that Mr Lynch’s apparent about-turn has been celebrated by diehard fans – and by Twin Peaks star Kyle MacLachlan, – who played FBI Agent Dale Cooper in the original series and is tipped to reprise his role. Favourite American Pharoah won the Kentucky Derby to give jockey Victor Espinoza back-to-back wins in the race before a record crowd of 170,513. The Bob Baffert-trained horse had won four times on the trot coming into the ‘Run for the Roses’ at Churchill Downs. American Pharaoh went to the front just past the final turn and finished ahead of Firing Line, trained by Englishman Simon Callaghan. Another Baffert-trained horse, Dortmund, finished third.